The family Oecobiidae (also called disc web spiders) contains about 100 species world wide. They are small, 2-3mm, some common species building tiny webs close to ceilings or in other corners or crevices around homes. The first two pairs of legs point forward then curve backwards. The species Oecobium navus (sometimes called O. annulipes, a junior synonym) occurs around the world. 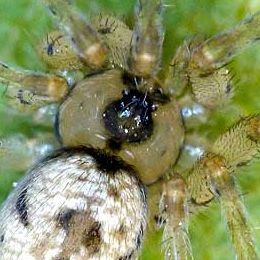 Due to this broad and probably human assisted distribution it has been described many times, but mostly resolved back to the spider Blackwall described in 1859.